Parashara Vedic Solutions - One Stop Vedic Solution Provider! Parashara Software Pvt. Ltd. is based at Jaipur, India and is an exclusive distributor of Vedic Astrology software products developed by GeoVision Software Inc. for the entire territory of India. GeoVision Software Inc. is based in the USA and is the largest Vedic Astrology Software publishing company of the world. On behalf of GeoVision, Parashara Software also manages a committed core team of full-time programmers, working in association with leading astrologers, at their Jaipur Office. GeoVision in association with Parashara Software is poised to make new grounds in various areas of Vedic Astrology and are continuously enagaged in developing quality Astrology Software based on the ancient Indian astrological classics. Parashara Vedic Solutions (a sister concern of Parashara Software Pvt. Ltd.) is engaged in the business of authentic Vedic Astrological remedies and solutions. We make available best quality astrological Gemstones and other astrological remedies like Yantras, Rudrakshas, Crystal and Parad Products, Shankhas, Rosaries etc. at the most reasonable prices and in confluence with the directives laid down in the Vedic scriptures. 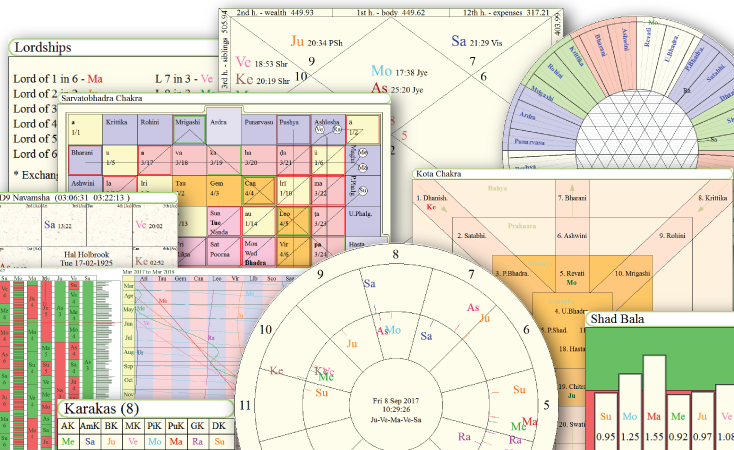 Parashara's Light is our flagship product and is an Ultimate Vedic Astrology Software. We have the largest number of users of Vedic Astorlogy Software in the world. Parashara's Light is named after Maharishi Parashara, the universally recognized rishi who composed a huge work known as Brihat Parashara Hora Shastra. Even though the greater part of this work has been lost, it is still recognized as the most important Classical text on Vedic Astrology. Jyotish means "light", and Parashara's Light is intended to bring out the complete understanding of Jyotish from Parashara. Since the translation of Parashara's work available today is suffering from many problems, i.e. mistranslations, typos, misplacement of shlokas, etc., trying to follow Parashara principles cannot be accomplished by blindly reading and applying translations. A higher, more comprehensive knowledge must be constructed by studying texts and source, and by researching the effectiveness of the techniques. In essence, Jyotish is a mathematical model of life. Jyotish describes through mathematical calculations the forces in life that shape all the aspects of human existence. The highly mathematical nature of Jyotish makes the use of computers a very natural option. Computers are only sophisticated calculators, and the application of machines and instruments to benefit Astronomers and Astrologers, goes far back in history. But it is the speed and flexibility of today's personal computers, which has created new and unique opportunities in the field of Jyotish. Parashara's Light - The leader in Vedic Astrology Software both for the Professional Astologer as well as beginners. It features a wealth of calculations, charts, tables, and interpretive reports. Sri Muhurta - An innovative Muhurtha software will automate the process of selection of the best muhurtha taking into account all the ancient astrological principles. Various elements required for the selection of muhurta like the Panchanga, the Hindu months, tithis, various yogas, and other conditions are taken into account to select the desired muhurta. Vedic Gems - It is a very much appreciated tool for Gemstone Recommendation based on classical Vedic Astrology Scriptures. There has never been a better way to study the fundamentals of Gem Recommendation in Vedic Astrology. With this software, you can not only have a Gem Recommendation based on planetary position of your natal chart and according to your problem, but you can also get to study the astrological parameters lying behind the recommendation. For scholars we have made available the physical properties of not only the Ratnas but also of the Uparatnas. Vedic Astrology Bookshelf - An electronic compilation of 16 Vedic astrology classics with automatic look-up of over ten thousand references applicable on any horoscopic chart. It includes Superfast indexing and searching of words and combination of words - a great tool for researchers. Parashara's Light - Windows Mobile Edition - It is the most innovative Vedic Astrology Software for mobile phones! It encompasses the richness of ancient Vedic Classics and also provides access to powerful research tools. Parashara's Light (Palm version) - Palm version of Parashara's Light offers the most popular Vedic Astrology calculations based on accurate algorithms and provides a complete and automatic atlas support. It runs on any Palm compatible device with at least 8M of memory. It is an astrologer's dream come true!